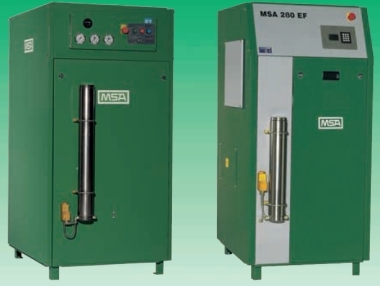 MSA offers a comprehensive range of high pressure breathing air compressors for both the firefighting and diving market, as well as other special applications. A variety of horizontal, vertical, portable and mobile models with a charging capacity from 170 up till 570 litre per minute [larger models on request] are available. They can be supplied with electric, gasoline or Diesel engines. All compressors together with their air purification system meet the most stringent breathing air standards [EN 12021]. No compromise has been made to ruggedness and durability, making the compressors suitable for the toughest duties. The specially designed low operation speed allows continuous and reliable operation. The vertical models 280, 450 and 570 have highly efficient noise suppressing cabinets and are among the most silent compressors on the market. The robust and noise muted compressors require little floor space and are very user friendly; all controls are at the most convenient operating height. The optional ECC - electronic operating and monitoring system - makes operating even more convenient. All moving components of the breathing air compressor blocks are electronically balanced to run smoothly. The last stage has a piston which is lubricated by a low pressure [1.5 bar] oil pump. Convenient cylinder filling systems are either separately mounted as a wall panel or integrated in the compressor. The filling-panels are equipped with self-bleeding, optimally noise muted filling valves with hoses. The models 280 and 450 has 3 stage blocks; the model 570 has a 4 stage block.